Grafted tomatoes, especially heirlooms, were really hot this year. Why graft heirlooms? Well, the reasoning is that by grafting the heirlooms we love—Brandywines, Green Zebras, Cherokee Purples, Mortgage Lifters—to a rootstock that’s got, say, great drought tolerance or disease resistance, you get what amounts to a super heirloom. The strategy isn’t new. Apple and grape varieties have been produced successfully on desirable rootstock for ages. But this is the first time that home gardeners in the U.S. are really starting to see grafted vegetables, including eggplants, peppers, cucumbers and watermelon, becoming increasingly available at the retail level. Territorial Seed Company, Johnny’s Selected Seeds and White Flower Farm are just a few of the places where you’ll find grafted vegetables. Still, I’m always up for trying something new. So I was happy to get a surprise box of grafted tomato seedling samples (some heirlooms, some not) from Mighty ‘Mato early in the season. Having a limited amount of sun to work with, I kept two for myself, an Indigo Rose and a Brandywine, and gave the others to master gardener friends to plant and report back on. 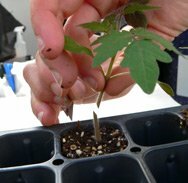 During the season, I also talked with more MGs and garden writers who were experimenting with grafted tomatoes. The outcome? Impressions were mixed. Take Indigo Rose, for example. I had been wanting to try Indigo Rose, which was introduced by Oregon State University in 2012. Their goal was to produce a tomato with high levels of antioxidants. 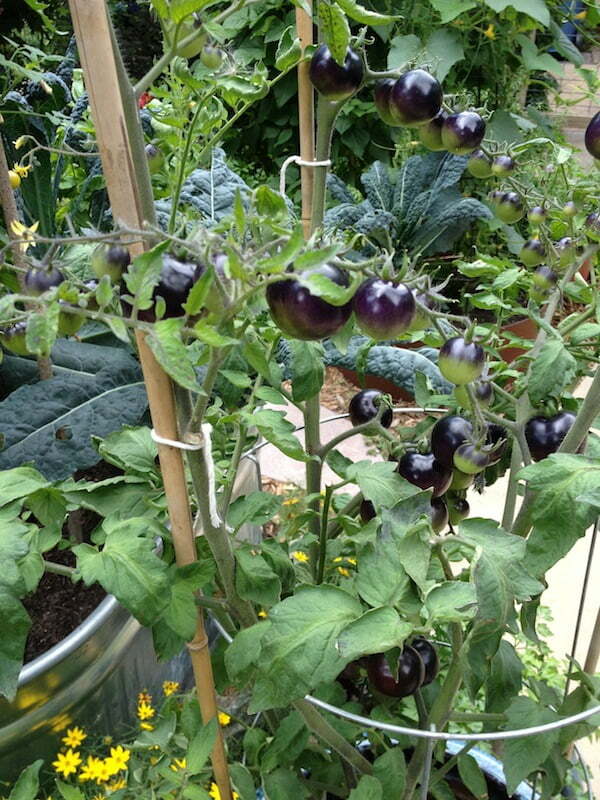 I wanted to grow the tomato because I fell for the weird looking purple-black fruit. I planted both grafted and ungrafted Indigo Rose tomatoes so I could compare the two (and so I could justify planting way too many tomatoes, like I always do). Sadly, though they both produced an absurd amount of fruit all summer long, I didn’t like either of them, mainly because the tomatoes took FOREVER to ripen and when they finally did, they tasted bland and watery. Also of note was the fact that I honestly noticed no difference between the grafted plants and the ungrafted plants. Most of the gardeners I’ve talked to had similar experiences with Indigo Rose, though I will say that a few thought they were tastier than I did. 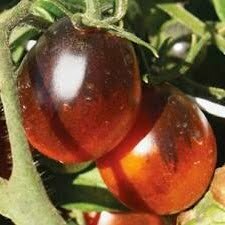 On the plus side, my friend, Deb, loved Mighty ‘Mato’s grafted Indigo Ruby, a cross between Indigo Rose and a cherry tomato. The plant grew well, was free of disease and produced very tasty tomatoes all season. I heard rave reviews from other gardeners, too, though I don’t know how they compared to ungrafted Indigo Ruby. As for grafted Brandywine tomatoes, by all accounts, including mine, the grafted plants didn’t do as well as the heirlooms usually do on their own. I did hear lots of good things about grafted Legend tomatoes—great taste, good disease resistance and a LOT of tomatoes. What does all of this mean? Well, at this point, I’m not ready to say that grafted tomatoes aren’t worth the price, which is steep compared to regular tomatoes, hybrids and heirlooms. But I’m not ready to sing their praises either. I’ll plant a couple more varieties next summer and report back on how things go. If you try grafted tomatoes, please let me know about your experiences. I’ll pass that information on so we can all compare notes. Tomato or potato? Why not both? Wow, some pretty tomatoes there! My grandmother’s grafted tomato, espaliered on a fence, covered at least 8sqm, but unfortunately I don’t remember what it was! Or perhaps it was my Oma’s green thumb, and not the rootstock, that led to such prolific growth! It’s fun trying out different ones, isn’t it? I have a whole bunch of different tomatoes this year – Burnley Bounty, Sweetbite, red & yellow Tommy Toe, Tiny Tim, Apollo, Black Russian, Green Zebra, Tigerella, Grosse Lisse Improved, Burke’s Backyard Italian, Romas (many! ), Tomboy, and one grafted (Apollo or GL, can’t recall without checking the label). So far, it hasn’t performed any better than any of the others, but my trial isn’t scientific in that the soil varies across the bed(s). Still, I’ll record my harvest and observations, and blog at the end of the season! Thanks for your note! I’m really interested to see how your tomatoes do this year. I haven’t heard of Apollo. I’d better check that out. I remember the first year I grew tomatoes after moving into our new house here, almost 4 yrs ago. I had no clues to what was good, what wasn’t, so all up I gradually bought 25 different varieties, some grafted, some hybrid! (what on earth was I thinking??) Well I learnt my lesson after that year, we virtually had tomatoes for breakfast, lunch and dinner, gave them away by the bucketload and made tomato chutney until I ran out of jars! Now funnily enough I just rely on the interlopers that pop up in the areas where my chickens free range and they can be any variety, pure pot luck and they just seem to be the strongest, most pest resistant and I find the various cherry tomatoes really fruit the best and don’t burst like some of the bigger varieties as the temps climb into the high 30’s celsius. When anyone mentions they want to start growing tomatoes, hubby and I look at each and laugh at our very first venture into growing our own. We don’t use any commerical fertilisers, purely our composted material, mushroom compost from a nearby farm and alpaca manure from a friends property and it seems to work. Twenty-five varieties – oh, my! I agree completely that cherry tomatoes seem to be the most reliable, especially in hot weather. I need to seek out some more varieties to try. Hello Meleah are you still here? I notice this is over 2 years old. Thank you for your thoughts. I’m in South-east Australia and I am also growing heirloom tomatoes. 20 years ago I was given a few tomato seeds that had originally come from a seed company here. I’ve been saving and planting this variety since. We think they are very special. I note that they seem to have been forgotten. I noticed that there is someone in the US still growing them but we may be the only two people doing that. In case you are interested they are called “Wendy Yellow.” They have a number but I’ve mislaid that info. for the moment. They are a cherry tomato. Yellow, full of sharpish flavour. Not the least bit bland. Quite different really. Cheers, Joy.